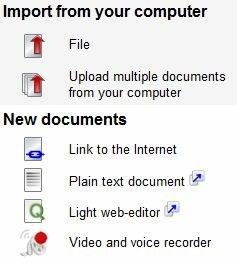 You can easily upload files containing finished material from your own computer to Optima. Remember, however, that Optima is only a data storage place, which means that all users must have the software required for opening the files (such as the Acrobat Reader for pdf files). All files uploaded to Optima must be less than 10 MB. Please note: You should save text files as doc files (rather that in docx format). This also applies to PowerPoint files. Users without the Microsoft 2007 software package cannot open x-ended files. You may also upload image files to Optima. Remember to crop the images and reduce them to appropriate size before uploading them. Always remember the copyright when uploading material! If you have found a good article in the Internet you may link it with the workspace (Link to the Internet). If you do not have the copyright to the material in question (= you have not created it yourself), create a link to a new window. Remember to give the link an appropriate name. Otherwise it will have a name such as ‘link3726’, which says little about its contents. The Light Web editor is an easy and quick way to create www pages. The Light Web editor can also be used for joint work and for writing assignments. Using the video and voice recorder you can easily create voice and video recordings and upload them to Optima (max. length 30 minutes). Your computer must have a microphone (for voice recordings) or a web camera (for video recordings). The voice and video recorder can be used for preparing assignments, giving presentations and for making interviews.